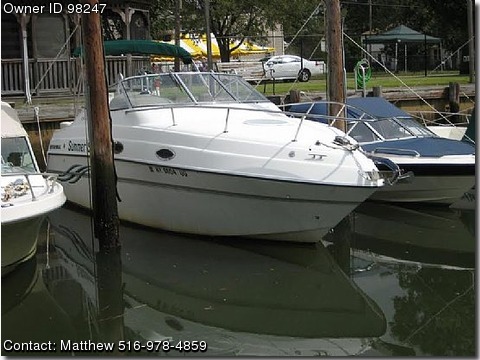 Please contact boat owner Matthew at 516-978-4859. 1999 Four Winns 258 Vista, 5.7 Liter Volvo Penta, stainless steel duo props, windless, AC, recently new water heater, new batteries, full Bimini/camper back enclosure, mooring cover (3yrs old), upgraded AM/FM CD and speakers. Dual Battery System, Recessed Trim Tabs, Pressure Water System, Water Heater, 110 Shore Power, Battery Charger, Head w/Shower, Full Galley w/Alcohol/Electric Stove-Deep Dish Sink-110/12V Refrigerator-Microwave Oven, Integral Swim Platform w/Fold Down Drop Ladder, Dockside H2O, H/C Transom Shower, Walk-Thru Windshield, Convertible Dinette, Aft Cabin, Sleeps 4/5,. This is a second owner boat that has been meticulously maintained and is in excellent condition. Complete maintenance records and receipts for all work completed.